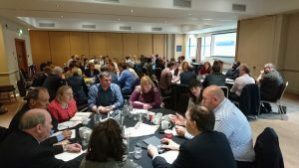 The Public Service Transformation Academy (PSTA) are pleased to launch the Regional Transformation Academies, capability development programmes for change-makers centred and hosted in each region – starting September. The Academy will immerse participants in the latest and proven practices on leading change across complex systems to enable you to bring to bear the ideas, assets and energy of all parties to realise better outcomes for the people you serve. Participants will benefit from masterclasses, workshops, expert speakers, peer challenge, a virtual site visit and practical action planning. A key part of the Academy is the application of learning to a practical challenge their organisation faces, and participants are supported to incorporate the new tools and insights into their approach to a project. Upon completion participants become members of an extensive alumni network of senior peers from across public services. The academy approach has been applied in multiple different contexts, and could facilitate delivery of a range of the region’s priorities. The approach has been tried, tested and proven successful in myriad geographies and service contexts.